Free Medium Iced Tea or Iced Coffee from Au Bon Pain! 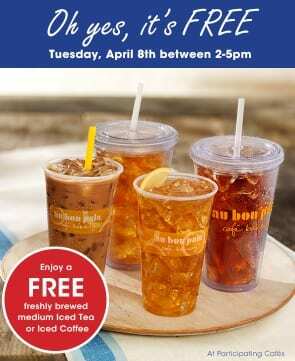 In addition to Ben & Jerry’s Free Cone Day on Tuesday, April 8, 2014, Au Bon Pain is offering Free Medium Iced Tea or Iced Coffee from 2-5pm on Tuesday. To find your nearest Au Bon Pain, please head here. *Note, I received this freebie notification in my e-mail as a member of their eClub. There is limited information and no indication you need to make a purchase to receive the free offer. Not all Au Bon Pains may participate so make sure you ask before you place your order.